Nigeria's main militant group has said it has blown up another pipeline in oil-producing Niger Delta. The Movement for the Emancipation of the Niger Delta (Mend) said in a statement it had used explosives to attack a pipeline operated by Shell. There was no independent confirmation of the claim by Mend who declared "war" on Nigeria's oil industry on Sunday. Meanwhile, officials say militants have freed two South African workers kidnapped last Saturday. If the pipeline attack is confirmed, the sabotage would be the fifth attack since Sunday's declaration. The militants claim to be fighting for greater control over oil wealth in the impoverished Niger Delta. But the groups make money from criminal rackets and trade in stolen oil, and many say they are criminal gangs out to extort money from oil companies. Nigeria's oil production has been cut by 20% because of unrest in the region over the past few years. The BBC's Alex Last in Nigeria say over the last six days, militants have attacked gas plants, oil installations and pipelines - part of an oil war declared after a rare but fierce military raid on one of their bases. 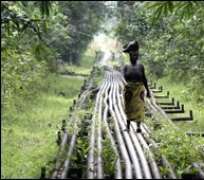 Reports of the attack on the pipeline in the east of the Delta came hours after the new Nigerian defence chief visited the region. Air Chief Marshal Paul Dike reportedly encouraged the troops in what was termed their "battle against criminality". In a separate development, Mend said it had handed over two South Africans it claimed to have rescued from "sea pirates" to the Nigerian authorities in Port Harcourt on Thursday night. South African Foreign Affairs department spokesperson Ronnie Mamoepa said the high commissioner in Nigeria had confirmed the release, the South African Press Association reported. The South Africans were among 27 people, including two Britons, seized from an oil services ship. The recent fighting is some of the heaviest in the last two years.